I know several folks who regularly say things like “God told me…” or “I heard the Lord say …” While I cannot prove to you from the Bible that God does not speak audibly to people today, I can share with you how you can know if what you heard is from God. These are the things that you should consider when you want to answer the question: How can I know when God is speaking to me? Genesis 3:8-10 And they heard the voice of the LORD God walking in the garden in the cool of the day: and Adam and his wife hid themselves from the presence of the LORD God amongst the trees of the garden. And the LORD God called unto Adam, and said unto him, Where art thou? And he said, I heard thy voice in the garden, and I was afraid, because I was naked; and I hid myself. The Bible records several instances of when God audibly spoke to people. We see it recorded in Genesis that the LORD’s “sound” was heard by Adam and Eve in the cool of the day. In these verses we see a definite two-way conversation between the LORD and Adam. Exodus 3:6-8 Moreover he said, I am the God of thy father, the God of Abraham, the God of Isaac, and the God of Jacob. And Moses hid his face; for he was afraid to look upon God. And the Lord said, I have surely seen the affliction of my people which are in Egypt, and have heard their cry by reason of their taskmasters; for I know their sorrows; And I am come down to deliver them out of the hand of the Egyptians, and to bring them up out of that land unto a good land and a large, unto a land flowing with milk and honey; unto the place of the Canaanites, and the Hittites, and the Amorites, and the Perizzites, and the Hivites, and the Jebusites. Moses also heard from the LORD. As you read further on in Exodus you see that Moses was afraid to do what the LORD told him to do because he felt that he was unworthy to be the leader of the Israelites (Exodus 3:11). In fact, when you read about the journey out of Egypt you see many conversations between Moses and the LORD. 1 Samuel 23:1-4 Then they told David, saying, Behold, the Philistines fight against Keilah, and they rob the threshingfloors. Therefore David enquired of the Lord, saying, Shall I go and smite these Philistines? And the Lord said unto David, Go, and smite the Philistines, and save Keilah. And David’s men said unto him, Behold, we be afraid here in Judah: how much more then if we come to Keilah against the armies of the Philistines? Then David enquired of the Lord yet again. And the Lord answered him and said, Arise, go down to Keilah; for I will deliver the Philistines into thine hand. When we believe that God is speaking to us even today we must be sure that it lines up with His Word. For example, one time someone told me that the LORD had told her to get a divorce and that she had “peace” about it. It is true that in the case of adultery you may seek a divorce when you are the spouse that has been injured. In other words, if you are not the cheater divorce may be pursued. The thing about this conversation that I had with the lady is that she had no grounds for divorce. She simply did not want to be married to her husband anymore. In this case, God was not speaking to her because it clearly went against Scripture. You know when God is speaking to you when you can have confirmation in His Word. Even when we are going through trials and tribulations, God speaks to us when He pulls us through life circumstances. Our life experiences are what prepare us for the next thing. Perhaps we lose a loved one. Truly it is a time that causes great stress for all whom are close to the beloved. When we ask God to show us how to deal with this situation He faithfully shows us how we can use it for good. You know when God is speaking to you when He tries your faith in life experiences. We see Him speak by the patience He gives us to deal with it. That patience turns into experience and that experience gives us great hope. Especially when in the future God places someone in our life that needs to draw on our experience. We should listen when God speaks to us through circumstances even when He may be just giving us subtle hints. The Apostle Paul allowed the Holy Spirit to use him when he wrote God’s Word down; truly he was inspired by the Holy Spirit. But did you know that on more than one occasion God communicated to him through other people as well? In the account of Acts 21 we read that Paul was warned by the disciples and then by the prophet Agabus. Because he neglected to trust these faithful men he spent over two years in jail in Caesarea as well as two additional years under house arrest in Rome. Think about that: Paul’s ability to witness to people outside of prison or outside of those that would come to see him was severely limited because he did not listen to what God was telling him through others. In our Biblical Counseling ministry God uses counselors to share the Word of God and discuss life circumstances with all sorts of folks. God speaks through the counselor regarding any number of life choices that have led to stress, heartache and generally an unhappy life. When people take the advice of the counselor they often see God move in their lives in positive ways. Likewise, when they do not heed Biblical counsel oftentimes they are handed even more trials and tribulations. The Bible records examples of when God audibly spoke to people in the past, but as a whole this was the exception, rather than the rule. He also uses His Word, life circumstances and even other people to speak to us today. When you believe God may be speaking to you always compare it with what His Word says. If that message does not agree with the Bible, then it is not from God because God never contradicts Himself. If you want to hear God speak to you the very first thing you need to do is purpose to be daily in His Word — that is where He will most likely tell you what He wants you to know. 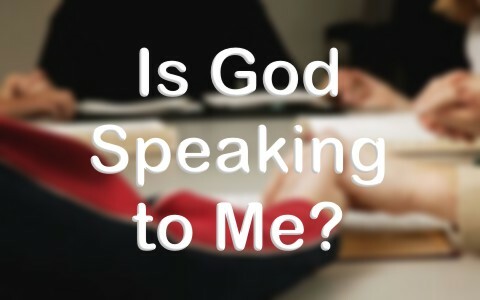 Something more to read: Does God Use Dreams to Speak to Us? This was sent From God! Thanks for answering the call and writing this article! I am a wee bit torn on the Paul not heading the warnings. Was it God’s will to show us in the Bible that even Paul made mistakes or was it God’s will for the prisoners to hear the Word of God from Paul? As you can tell Ms. Williams, I am really in a mixed up place in life and hesitate to follow through on anything mainly because I thought I heard God and tested the Fleece so to speak and thought I was suppose to try this business and that business only to fail. I think other people go through this as well and it allows the Devil to say you don’t know what GOD wants you to do so it causes failure and doubt to creep in. Perhaps an article to me and then to the readers would be great. Thank you for your comment and I believe you hit the nail on the head when you said that even Paul made mistakes and perhaps God used him to share the truth with the prisoners and that is why he was imprisoned. My husband often says that if he was ever thrown in prison for preaching Jesus and His truth, than he would start a prison ministry! I will write an article in the future that addresses your question on how Satan may or may not interfere with God’s will. Look for it! Next post: What Is The G-12 Vision System?